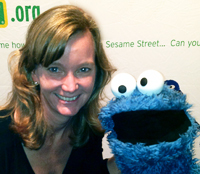 In the Q&A below, get to know more about PBS'er Tricia Moore. Tricia is Director of Conference Services, and is part of the team that supports internal and external meetings for PBS. These include the Winter & Summer Television Critics Association Press Tours, PBS Technology Conference, PBS Annual Meeting, quarterly Board Meetings, and more. I joined PBS in August of 2000. Prior to PBS, I was the Corporate Sales and Catering Manager at the Morrison House Hotel in Old Town Alexandria. PBS was one of my clients and I heard great things about the organization. It was perfect timing since I was looking for a change from the hotel industry. Q. Tell us about some of the big events coming up. My teammates, Tim Morin and Sonja Johnson, and I recently wrapped up the TCA Press Tour, which is always a great meeting. We also had a Board Meeting, and TechCon and Annual Meeting are right around the corner. These keep the team busy working on registration, websites, speakers, concurrent sessions, sponsorship, and lining up venues and vendors. Annual Meeting for 2014 is taking place May 12 through 15 in San Francisco at the Marriott Marquis. It's been awhile since we hosted Annual Meeting in San Francisco so we’re very excited to be going back. I think our participants are really going to enjoy it. We’re working closely with our colleagues, as well as local stations who have been very engaged and a tremendous resource. Q. What are your memorable moments from PBS events over the past 13 years? My most embarrassing moment was at last year's Press Tour. Our security guard stepped away from his post at the ballroom entrance for a moment, and while I was covering him, I ended up stopping Cookie Monster from entering since he didn't have a badge. I didn't realize who the puppeteer was and he was carrying a gym bag with Cookie Monster inside. Another memorable moment was when the caterer set off the fire alarm at the Smithsonian National Museum of the American Indian and we had to evacuate the building right before our guests arrived. We were cleared to go back inside just in time. Another moment I'll never forget was when the chairs for a dinner got stuck in a broken elevator. We couldn't figure out how to get them out or what our guests were going to sit on. It all worked out, thank goodness. Q. From Press Tour to Annual Meeting, you’ve seen your fair share of famous faces. What encounter was your favorite, and why? I have been very fortunate and have seen some famous faces but meeting Grover was my favorite. He was the first SESAME STREET character I met in person. He was so cute and funny. Q. You’ve traveled for events in all corners of the U.S. Which city has been your favorite to visit? Which airport is your favorite? I recently traveled to Chicago and was really impressed. It had been awhile since I was there and the architecture and views are amazing. It has so much to offer. As for airports, you can't beat Santa Barbara, Calif. I believe they literally have five gates. That's my kind of airport. My father was in International Business so we grew up overseas and lived in Trinidad, Brazil, Jamaica and Puerto Rico. My family spent most of our time in San Juan. What I miss most from Puerto Rico are the people, and, of course, the beach. I went to the University of Richmond -- Go Spiders! -- and graduated with a degree in Business Administration with concentrations in Marketing and Finance. ...our content can influence and touch so many lives.